Once upon a time, there was a cucumber called Colin who had been born on one of the beautiful fields in southern Spain. Colin the cucumber had been in the earth for many days since he was just a little seed – until today, the day he was picked by the farmer. Each of the cucumbers grown all over Spain are closely examined, then sorted out and packaged to be shipped out later. That’s how Colin and his cucumber friends were going to get to the supermarkets and from there to people’s homes. 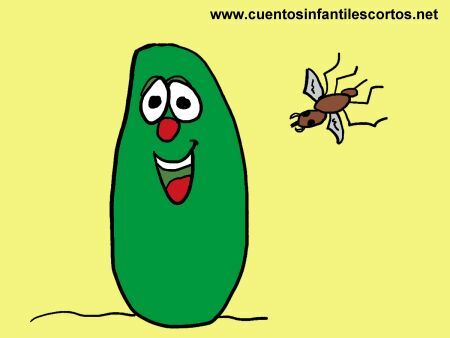 Together with the other cucumbers from his field, Colin was placed in a box by the farmer and put into a refrigerated van to be transported to Germany, for Spanish cucumbers are very popular there. On the other side of the window, the little mosquito that had been in the German vegetable warehouse – the very same one that had stung Colin – was laughing his head off. Colin quickly realised that that mosquito was to blame for everything that had happened. But the German cucumber checker was so angry that he warned all the shops not to buy Spanish cucumbers, so they didn’t. After a few days, they found the mosquito trying to bite some tomatoes that had just arrived. It was then that the German buyers realised that the problem wasn’t because of the Spanish farmers, and that they had been too hasty in judging the Spanish cucumbers.